Do you know the three things that are most often on Bishop Lowry’s mind from the moment he wakes till he goes to sleep at night? What’s the Mission of each church in the Central Texas Conference? What about the vision of the conference and how it impacts decisions on every level, or how living into the Five Practices of Fruitful Congregations is basically walking in the footsteps of those early Wesleyans who were building the Methodist Movement? If you are confident in the answer to all of those questions, then well done good and faithful servant. But how about the person who sits next to you in church or Sunday school or…? How assured are you that you could answer these questions should you be asked by a visitor? 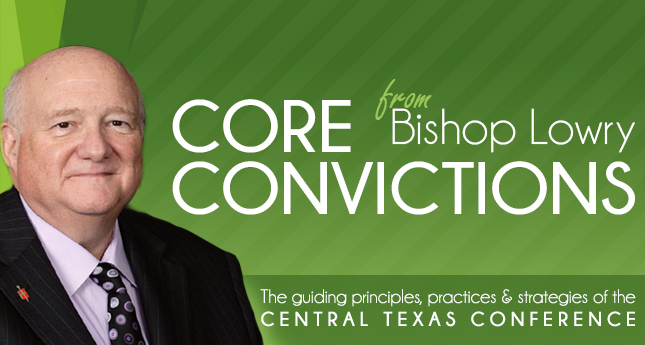 Click on the download button below to access an overview of the Core Convictions presentation that Bishop Lowry uses when talking to churches and other groups about the guiding principles, practices and strategies of the CTC. Please use these ideals and tactics to foster and assist in dialogues with visitors and members of your church regarding the direction of your church in the pursuit of our incredible mission of making disciples of Jesus Christ for the transformation of the world.